Portugal was one of the earliest of the great sea faring nations with a large colonial empire and its contribution to navigation and the early mapping of the world is well known. It has one of the oldest continuous serving navies in the world. A colleague in Portugal has sought information from museums and collectors and reports that there are no examples of boarding axes in the main naval museums or their stores. As they were considered crude tools there appears to have been no attempt to document, record or preserve specimens. 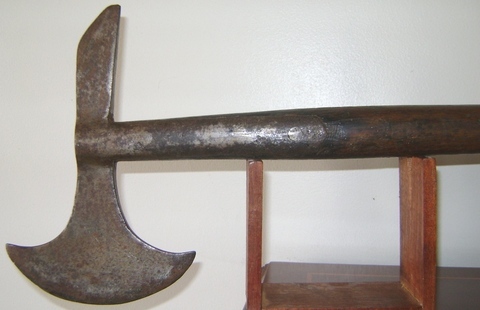 There appears to be no evidence of a standard government pattern that was used throughout the navy, but there are examples of Portuguese boarding axes - Machadinha de Abordagem. Naval Unit Commanders outfitted their ships with the quantity and quality that they thought appropriate and from what was locally available or manufactured to their design. As ships acquired more and heavier guns the need to clear away debris increased the need for boarding axes and the number of axes carried by ships increased considerably by the end of the end of the 18th century. As can be seen from the following example Portugal was no exception. The equipment list of the “Santo Antonio e São José” a vessel of 182 feet length and a crew of 611, recorded 60 axes in 1781, which was increased to 100 axes in October 1785. There were once many Portuguese axes. These two axes, above, were recently discovered in Portugal. They are near identical in dimensions, shape and weight although some small differences can be seen consistent with hand manufacture. It is thought that these two axes were part of a batch made for a ship or group of ships in the first half of the 19th century. As Portugal was often an ally of Britain, except for the short period when it was ruled by Spain, it is perhaps no surprise that these axes show similarities with British design in the shape of the langets, the spike and the round handle tapered at the axe head and then swelling at the upper hand position. 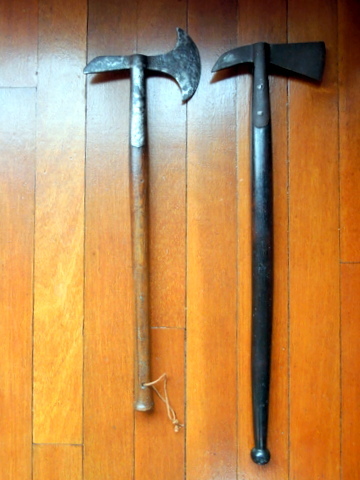 There is very little information available on Portuguese boarding axes so if you can add any information or pictures or you have seen another axe similar to those above please email me. Há muito pouca informação disponível sobre machadinhas de abordagem Portuguesas; por isso, se você pode adicionar qualquer informação ou imagens ou já viu machados semelhantes aos acima ilustrados, por favor envie-nos um e-mail. The Portuguese axe is very close in size and weight to British pattern axes of the same era.